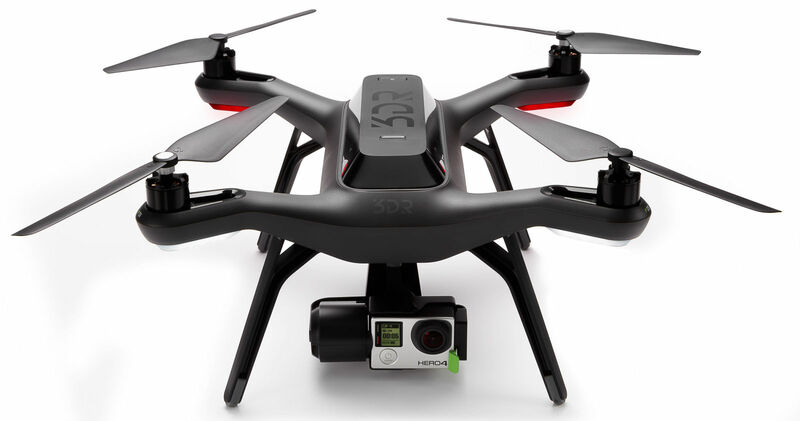 Solo, is the name of the new drone from 3D Robotics and it does not have an integrated camera. In fact you can add your own GoPro to the unit. However it does not require the user to buy and install expensive add on kit to get the first person perspective from the camera when it is flying. This will give flexibility of using a GoPro on a drone for a particular shot and later use the same camera on the bike helmet for the next shot. The Solo is run by dual Linux based computers, one computer in the drone and another in the remote control. The aerial footage is made rock steady courtesy an integrated 3-axis gimbals and can be used with the current GoPro models. The gimbal feeds power to the GoPro besides streaming video ensuring that that it won’t run out of power mid-flight. Solo comes with a number of safety features which is inbuilt in the drone. It includes automatic takeoff and landing. The flight paths are all pre planned via GPS. The operating range of the drone is half a mile and it can fly nonstop for 20 minutes with a camera on its head. An app available on iOS and Android allows the user to select pre set drone and camera movement for taking breathtaking and dramatic shots. Other extras include a follow mode that automatically tracks the user—perfect for recording extreme sports—and an aerial selfie mode. The user can stream live footage to a monitor or a broadcast device or better still connect goggles to get a true first-person flight experience. The footage is almost near real time courtesy 180 ms video latency which comes into play here. Solo has been designed by its makers keeping expandability in mind and its gimbal could be replaced with models for other camera. The user could get a live feed to his smartphone or tablet if the attached gimbal and the camera support it and is compatible with it. The drone’s software is based on an open platform and developers can add functionality as per the need. The Solo will go on sale in May for $999.